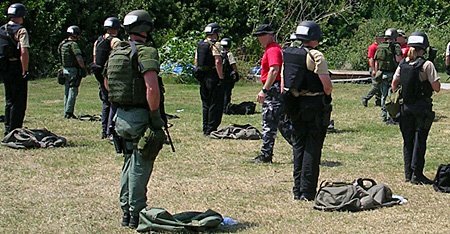 Here are all of the police training articles on BlueSheepdog.com. They are generally divided into specific categories, but there are still a lot that are listed in the “general” section because they did not neatly fit under one of the other headings. At a later point these might be broken out into additional categories to help in navigation. There are also hundreds of other, shorter training articles, safety tips and equipment reviews in the blog. Use the search box to find something specific there. The DUI training articles section has a series of in-depth articles on conducting standardized field sobriety tests and was written by a SFST instructor and certified drug recognition expert who has logged many hours as part of a DUI unit. It is an excellent set of training articles that is well worth reading as a refresher or to better learn the techniques. The field training articles are all about teaching and scoring recruit officers once they graduate the academy and hit the road. If you are looking to make FTO, some of these might be of interest to you as well. Firearms should be an obvious category. Though fired infrequently, handguns, rifles and shotguns all play important roles in keeping the public safe and ensuring you go home at the end of your shift. There are fewer topics that are more important. A section on officer safety is also a no brainer. These training articles cover all sorts of topics from contact and cover to pre-attack indicators to working with the mentally ill. Traffic stops, in progress calls and much more are touched on in this section. If it doesn’t fit anywhere else, check the general training section. These articles can deal with any number of topics including report writing, investigations, domestic violence and murder.